Steamed Parboiled Wholegrain rice & Quinoa with Tomato & Basil. In need of little inspiration? Why not try our Wholegrain & Quinoa with Tomato & Basil served with oven baked chicken, roasted aubergine, courgette and tomato, drizzle of oil and sprinkle of rosemary & thyme. 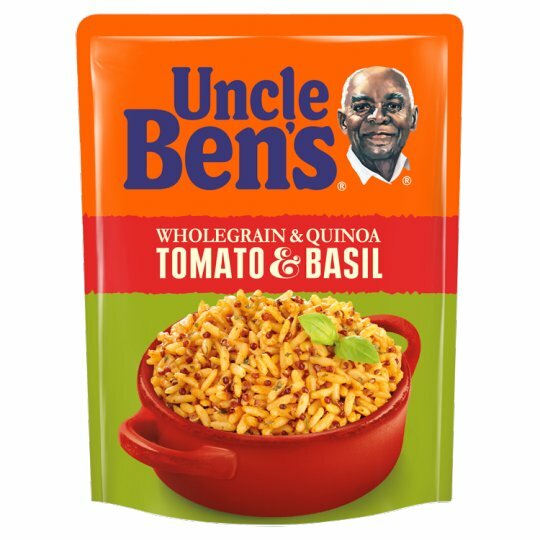 Our Wholegrain Rice & Quinoa is carefully flavoured with Tomato, Basil (and a bit of Uncle Ben's know-how). Simply no need for artificial flavours, preservatives or colours. Boil 30ml (about 2tbsp) water.